Found in FNA Volume 8. Treatment on page 503. Mentioned on page 376, 496, 497, 504, 507. Shrubs. Stems ascending or spreading, (sparingly branched); young twigs glaucous (bud scales glaucous). Leaves persistent; blade linear to narrowly elliptic or oblong, coriaceous, margins entire, revolute (often completely so), abaxial surface glabrous or densely hairy (hairs fine, erect); venation reticulodromous. Inflorescences terminal, umbelliform corymbs, 2–8-flowered, sometimes flowers solitary, (produced on previous year’s growth); (bracts glaucous). Flowers: sepals 5, connate for ca. 13 their lengths, dentate-triangular; petals 5, connate for nearly their entire lengths, pink, corolla globose-urceolate, lobes much shorter than tube; stamens 10, included; filaments straight, flattened, hairy, without spurs; anthers with 2 awns (awns solid, slender, ascending awns bent at an angle to anthers and curved-ascending), dehiscent by apical pores; pistil 5-carpellate; ovary 5-locular; stigma subcapitate. Fruits capsular, 5-valved, (with unthickened sutures), obovoid to subglobose, dry. Seeds 25–35, ovoid or ellipsoid; testa multilayered. x = 12.
n North America, Europe, Asia. Species 1 or 2 (1 in the flora). A study of leaf anatomy by K. Lems (1964) showed that Andromeda differs from other members of tribe Andromedeae in many of the 26 characters studied; notably, the petiolar bundle sheaths are typically cresent-shaped and lateral veins arise from the horns of the crescent, phloem occurs only abaxial to the xylem, leaves have pleuroplastic venation with sparse reticulation, and vein endings are very thin with conspicuously large bundle sheath cells. Based on autapomorphies, including the lack of calyx and corolla stomata and strongly multilayered testa, P. F. Stevens et al. (2004) considered Andromeda to be closely related to Zenobia. The leaves and twigs are used in some parts of Russia for tanning leather. 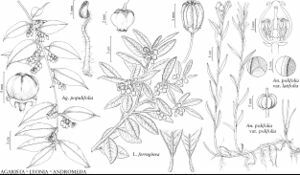 The poison andromedotoxin (also called acetylandromedol or grayanotoxin) was first isolated from Andromeda polifolia and later found to be common in other genera of Ericaceae; it causes low blood pressure, breathing difficulty, vomiting, diarrhea, cramps and, potentially, death. A single ingestion of “mad honey” causes poisonings in Europe and Turkey each year (H. Özhan et al. 2004).